Star Wars Pit Droids! is a kids game based on the comic relief characters from the podracing segments of The Phantom Menace. If this game was produced by serial arsonists, it could not have any less going for it. You’d be excused for passing it over. Against expectations, the designers at Lucas Learning put together a decent Lemmings-style game. 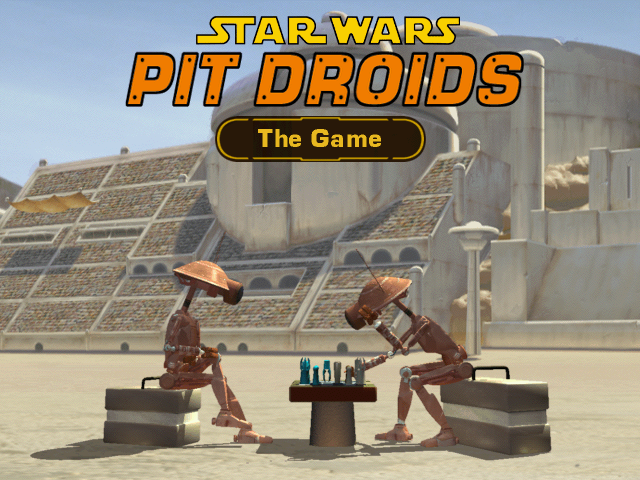 In the game, a fleet of pit droids, the lovable slapstick magnets who work maintenance on pod racers, frantically travels from a freight ship somewhere on Tatooine to the Mos Espa Arena. 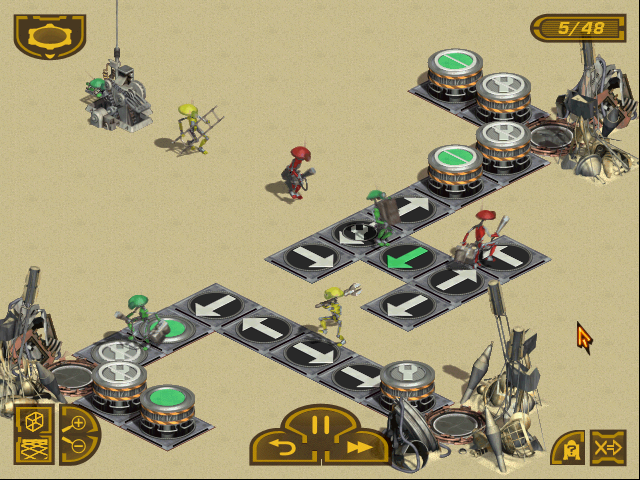 Players lay down an array of directional arrows that guide the pit droids towards the goal of each stage, typically located at the end of a maze. Levels increase in complexity, adding new ways to sort the pit droids and switching from square-shaped tiles to a hexagonal grid. Though you start with quite a few droid lackeys (an unlimited number on the easiest mode), only ones that survive to the end of a stage will continue on. Should all your droids die on one of the later levels, you may have to retrace your steps to get more. The game makes great creative use of a small corner of the Star Wars IP. Levels are bookended with slapstick interludes featuring the pit droids; their bumbling work ethic fits perfectly into this sort of slapstick engineering game. A few familiar characters pop up during cutscenes and tutorials too, including Watto the junkyard dealer and C-3PO. LucasArts grabbed the original voice actors, which lends some authenticity. Most of the game’s 300 stages involve routing lines of pit droids through complicated intersections. The droids launch into the level at a regular rhythm, which can lead to all sorts of fun interweaving and interesting timing-sensitive patterns. The occasional oddly placed gate puzzle might also stand in their way. Some special arrows and gates will only affect droids with a certain body color, helmet, or tool, lending a managerial aspect to the traffic cop, Chu Chu Rocket-esque gameplay. Despite these extra facets, the game is never overbearingly hard. Presentation-wise, Pit Droids! nails it. The pre-rendered visuals are crisp and unusually vibrant, like a cleaner version of a game like the original Fallout. The pit droids have such expressive animations, even and especially when walking into a wall. The interface and sound borrow directly from Episode I, and there’s even a well-placed snippet of “Duel of the Fates” during the installation. Make no mistake: this is a LucasArts game, and despite taking place in a postage stamp of the Star Wars universe, it maximizes the license’s aesthetics. The end product is fine! The puzzles are never better or worse than mildly clever and mildly challenging. At times, the wait for all the pit droids to complete their prescribed route can be tedious. But the nonabrasiveness is pleasant too. Pit Droids! is a good puzzle game for a younger audience, and it does right by the world-building that Episode I accomplished. UPDATE: For those interested in giving it a shot, Pit Droids! has been re-released for iOS.